Tétris created an elegant aesthetic for the offices of IFFCO, a multi food products group, located in Milan, Italy. IFFCO, an innovative and integrated multi food products Group based in the United Arab Emirates focused on offer great value to consumers, entrusted Tétris with the design&build project for the relocation of their offices in Milano located in the premises of Bicocca District in a LEED certified building. The office entrance is characterized by an elegant waiting area cloaked from the rest of the space by tailor-made wooden finishes and an exhibition bookcase adorned with pot plants. These functional elements divide the representative area from the operative space by conferring the environment an inviting, fresh feeling and discretion based on a game of transparencies. 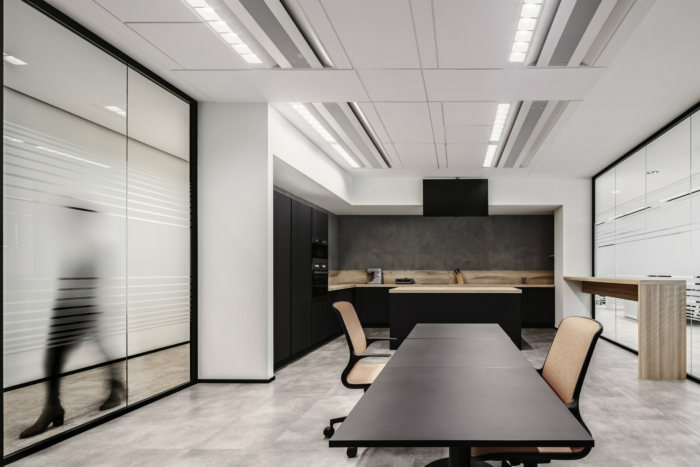 An extensive and airy open space is developed on the long side of the floor so that work stations can benefit of natural light whilst the peripheral and central areas are organized into foldable small meeting and board rooms as well as cellular offices and Skype rooms. The entire project revolves around a spacious break area located in the very heart of the office. This multifunctional kitchenette is for the use of daily employee activities or enjoy a coffee with colleagues and it is also fitted to host gourmet demonstration with professional chefs showing how to use IFFCO food products. A camera projecting on a ceiling monitor has been also installed to display the attendees what the chef is cooking. Here the design reproduces the atmosphere of a chic lounge bar café with an industrial mood: white bricks, modular style windows, pendant lighting, wood furniture and PVC flooring with a concrete effect. In the rest of the workspace the timber, concrete and carpets materials have been combined creating a pattern of neutral nuances and sober lines in contrast with the bright and intense black and red colors inspired to the corporate brand identity. A touch of lime-green details liven up the professional vibe of the venue.